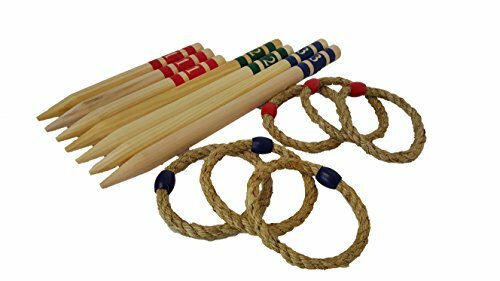 Quoits Outdoor Ring Toss Game Set by Dondor - Game Set Includes: 7 Wooden Stakes, 6 Rope Rings, Large Wooden Stakes Measure 16" Inch by 1" Inch / Medium Stakes 10" Inch x 1" Inch / Rope Rings 5" Diameter, Great Fun For Adults and Children - Use in the Garden, at the Beach..Teaches Eye / Hand Coordination while Having Great Fun! Teaches Eye / Hand Coordination while Having Great Fun! If you have any questions about this product by Dondor, contact us by completing and submitting the form below. If you are looking for a specif part number, please include it with your message.